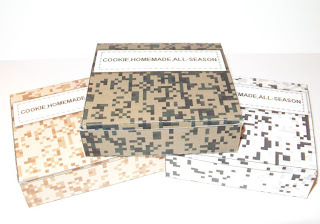 Camouflage cookie boxes in 3 colors. I was originally planning on doing them in the old style camo, but decided to see if I could do a digital camo effect, then I just colored it 3 ways. I hope you like them. The finished box size is 3x3x.75 inches printed at 100 dpi. 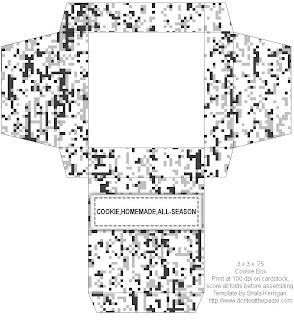 When I showed my husband the snowflake box and said it was the right size to give someone one cookie, he said "That's not very generous. 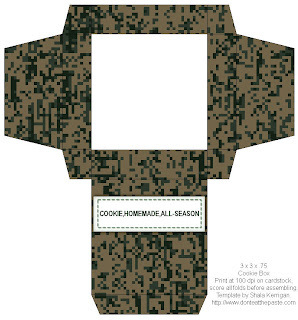 One cookie?" and I said "When I make cookies, how many are you willing to give away?" and he said "None." So I said one is a lot more generous than none. This one I made just a little deeper. I think it will fit 2 cookies if they are fairly flat. 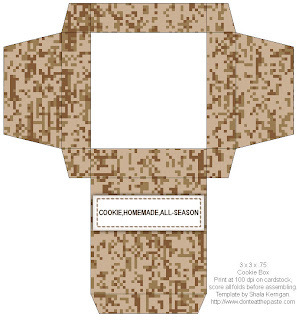 Just don't ask me for cookies. Except maybe shortbread. I'm still baking a lot of that working out recipes. Click on the images for the full sized versions. This cracks me up. I usually make a batch, pig out on them all day/night, then give them all away the next day because I'm so sick I couldn't possibly eat another one ever. Repeat forever. =) I'll be linking.